An Alaskan Malamute puppy is back in safe hands after being stolen from a San Jose home last week, the Mercury News first reported and police confirmed. The dognapping occurred on Dec. 23 when the pup's owner arranged a meeting to sell the dog at his home, according to police. Two men arrived at the residence to finalize the deal, but they promptly beat the owner with a blunt object and subdued the man with a stun gun. Aside from heisting the young pooch, the thieves made off with cash and other property. 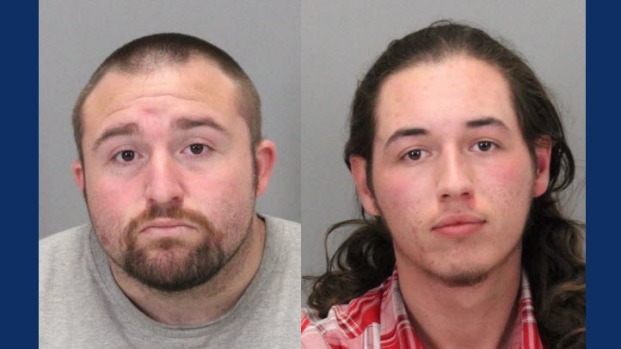 Responding San Jose Police Department officers Rafael Varela and Frank Montoya along with officer Alan Yee joined forces to hunt down the suspects, according to police. That they did. After gathering leads, the law enforcement officials identified 19-year-old Raymond Gonzalez as a potential suspect. Yee continued to work on the case into the Christmas holiday when he discovered a man that resembled Gonzalez standing next to a car. Yee's intuition was right. The officer arrested Gonzalez and, low and behold, the pup was hanging out in the front seat of the robber's car. The wolf-looking pup was back in the arms of her owner by the end of the festive day. "It was like our own little Christmas story," Yee told the Mercury News. "We’ll remember this. Having all that work pay off and result in an arrest was a great Christmas present for the team as well as the victim." The second suspect, who was later identified as 26-year-old Andrew Kavanagh, was arrested Monday, according to police. The dog's owner suffered serious but not life-threatening injuries during the attack, police said.